Hob Moor has a long history. During the visitations of the plague in the 16th and 17th centuries, victims were brought from the city and housed in wooden lodges on Hob Moor. They would pay for food brought out to them by placing money in water or vinegar in the central depression in the Plague Stone. Beside the Plague Stone is the Hob Stone, the effigy of a knight of the de Ros family. It was sculpted in about 1315 and is now much eroded, but the head, shoulders and shield can still be seen. Both these stones are beside the main path (formerly known as Hob Lane) on Little Hob Moor. ‘This image long Hob’s name has bore who was a knight in time of yore and gave this common to ye poor’. The Hob Stone in 2007 with the shield still visible. 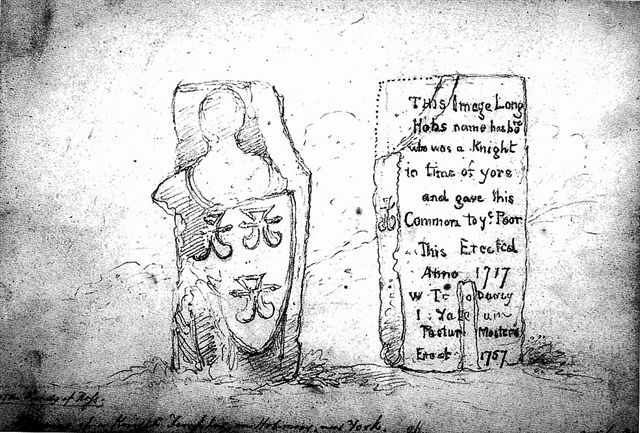 The plague stone can be seen in the left-hand picture, in front of Hob Stone. There is documentary evidence of a medieval water mill, called Folly Mill, in the north-east corner of Hob Moor, and the beck and drain in that area may be part of the water management associated with the mill. * Excellent medieval ridge and furrow. * “Narrow” ridge and furrow dating from the Napoleonic Wars (early 1800s). * The line of the former city boundary. * Greens and bunkers remaining from the golf course (1920-1946). * An old causeway, part of a path leading across the fields outside the city towards the Minster, which can be clearly seen from Hob Moor.